Home > Regulations and Law > What Happens If You Video a Cinema Film? If you go into any cinema in the UK and take in a recording device to record the film, there may be little anyone can do about it. Taking a recording device into a UK cinema and recording what goes on in the theatre is not illegal – recording the film is against copyright from the film, but this is very difficult to stop if cameras are allowed. Although pirate DVDs of recently released films are a big problem for the film industry, these are generally not produced by filming in the cinema with a mobile phone. The latest phones certainly have the battery power that would last the time necessary, and have good resolution, but without a steadying tripod the resulting film is poor quality and difficult to watch. It is much more likely that a pirate copy of a recently released film will be one made by downloading the film from the internet. File sharing and downloading films from shared online files has become much more of a problem and the film making industry has tried very hard to put a stop to it. Recently, they were dealt a serious blow when the courts in Ireland ruled that it was illegal to cut off the internet service for people found guilty of downloading films illegally. Although the court recognised that the activity of actually downloading the film was against the law, they also ruled that it was not within the powers of the film makers to force and internet provider to withdraw service from named individuals. Even if it the law was changed to disallow camcorders into a cinema it is unlikely that mobile phones would be banned, as video is only one of their functions (and not all phones can be used to shoot video). Some people would like to see this happen, however. Not because people might make pirate copies of the film but because thoughtless mobile phone users distract them from enjoying a film they have paid to see. Many people take little notice of the requests at the start of the film to switch their mobile off, or even to switch it to silent. If you are sitting in the dark of the cinema in front of someone constantly checking twitter or their text messages, the phone is still annoying because of the light coming from the screen, even though it is silent. Apparently the situation is much worse elsewhere in the world; in the USA, a packed cinema can have at least half the people actually taking calls, some relaying what is happening in the film to their friends, in a blow by blow commentary. With rising prices of tickets, extortionate prices for food and drink in cinemas and the problems caused by mobiles, some cinemas are really struggling in the recession. 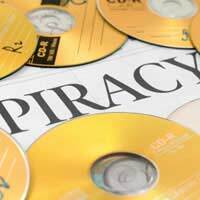 Pirate DVDs and illegal internet downloads are taking their toll too but new competition is now coming from legal and film-maker promoted internet downloads. Legal digital streaming of new films is being actively promoted so that people with computers can watch new releases in the same way that they watch TV programs that they have missed. Services like Spotify do for films what BBC iPlayer and ITV Player have done for serials and soap operas.